The Canon EF 200mm f/2.8L II USM Lens employs Canon's famous rear-focus telephoto optical design that delivers outstanding picture quality. This lens also uses two ultra-low dispersion glass elements to ensure maximum image sharpness and accurate color fidelity. Canon's advanced Ultrasonic Focusing Motor and rear focusing design give silent, high speed auto focusing with full time manual focus override. Because of its full compatibility with 1.4x and 2x extenders, you have the option of added reach. 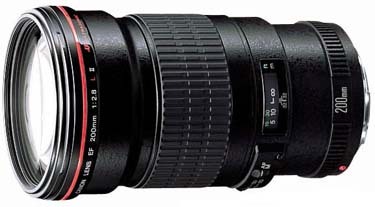 This lens is ideal for indoor sports shooting, wildlife, and arena events and ceremonies. Notes: Compatible with both full frame and crop frame sensor Canon DSLR cameras.